John McAfee, founder of McAfee antivirus, recently took to Twitter to announce a new business venture- a White Paper production service for firms going for an Initial Coin Offering (ICO). For the uninitiated, a White Paper for an ICO is a document which details the company’s idea behind the coin offering, the problem it focuses on tackling, an explanation of how the digital currency would work along with the economics involved, the team undertaking the ICO, and the token deployment plan. 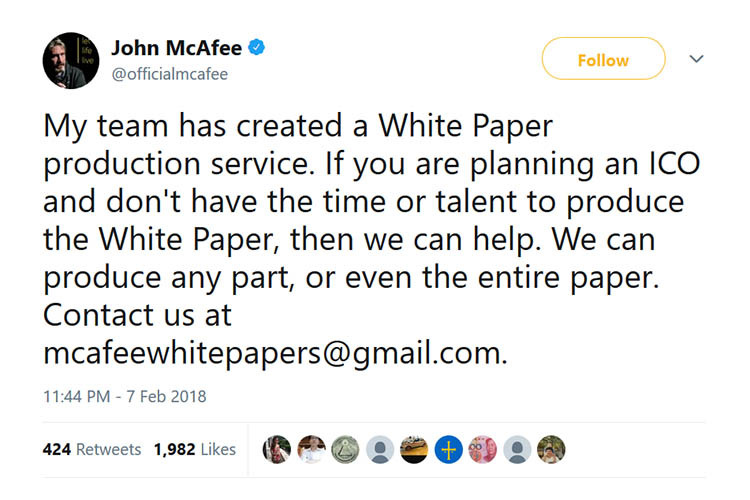 A number of people in the comments questioned the need for such a service to which McAfee replied by saying that usually the team offering an ICO is full of developers who have little or no experience of writing White Papers. McAfee’s service aims to help such developers put together a White Paper for their coin offering. "don't have the time or talent to produce the White Paper"
Why should anyone lacking in these be planning an ICO -or issuing tokens? An intriguing idea. #Dogecoin already has a white paper but we are thinking about publishing a green paper or MAYBE even a blue book. Are you able to accommodate these other colors? A Gmail address? Really @officialmcafee? You are a computer expert with massive resources and you can't spend the $20 on a proper domain? Doesn't lead to credibility of your team! In all seriousness though, while McAfee’s argument about developers not being qualified enough to write a White Paper holds true to an extent, the service seems apt for exploitation, given the plethora of scam artists in this field today.